BURLINGTON - Considered in the pantheon of best-selling leftie bumper stickers, "Another World Is Possible" sounds a little blah. Whereas "No War!" and "Impeach Bush" promote specific agendas, "Another World" smacks of dreamy, Clinton-era globalism. Perhaps it's just hard to remember that the United States once employed a modicum of diplomatic tact. Either way, "Another World Is Possible" is still the hopeful mantra of the World Social Forum (WSF), an annual international "encounter" of grassroots organizers and NGO wonks. In its first seven years of existence, the social-justice gala has taken place in such diverse countries as Brazil, India and Kenya. But this year, WSF honchos have scrapped the conference, instead asking local organizers to stir things up in their respective 'hoods. Taking their cue from that WSF directive, central Vermont organizers are putting on politically charged events for a full week in Burlington, beginning last Sunday and concluding on Monday, January 28. This Wednesday: a "Racism and War" panel discussion at the University of Vermont. Thursday: action at a Burger King in South Burlington in solidarity with the Florida-based Coalition of Immokalee Workers. Friday: a screening of filmmaker Michael Moore's gut-wrenching Sicko. 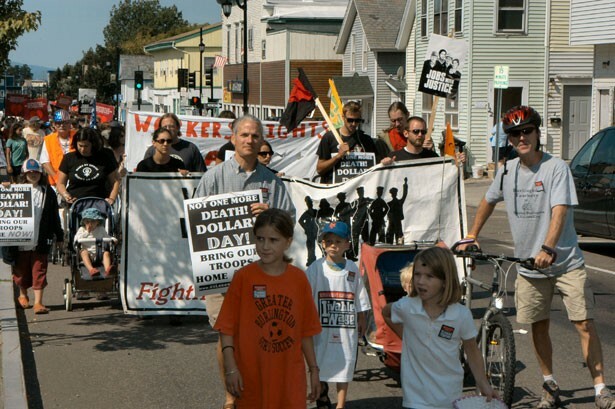 And on Saturday, January 26, a "worker justice" conference at UVM's Davis Center, followed by a march to Church Street. The message? "TROOPS HOME NOW, HEALTH CARE IS A RIGHT, CLIMATE JUSTICE." "The idea of [this week of action] is 'unifying movements,'" explains Anne Petermann, co-director of the Hinesburg-based Global Justice Ecology Project. At 4 p.m. on Saturday, her organization will coordinate a post-march panel on climate change at Burlington's City Hall Auditorium. "The war for oil and global warming, the health-care issue? These are really classissues," says the activist, who just returned from a U.N. climate-change conference in Bali. "And if we address them in a united way, we'll get a lot further than if we remain fragmented." Fellow organizer James Haslam agrees. "We sent a big group of people to the  U.S. Social Forum in Atlanta," recalls the director of the newly revamped Vermont Workers' Center (VWC). Since then, "We've been trying to figure out how to connect workers' rights and livable wages to the bigger picture . . . You can't talk about making Burlington a livable city without dealing with issues of racism and inequity." Sure enough, organizers weave local threads into their one-world rhetoric. Petermann, for one, accuses Republican Governor Jim Douglas of hawking "false solutions" to climate change. Haslam says 2007's Act 82, which changed education funding, isn't "workable policy." And a spokesperson for the Burlington Peace & Justice Center stumps for H.337, a bill that would force employers to grant full-time workers seven paid sick days per year. On Monday, January 28, food-service workers at the Burlington School District will enter a new round of talks with district administrators; PJC is promoting "Citywide Livable Wage Button Day." VWC's Haslam expects "a number" of Vermont politicians, including Burlington's Progressive Mayor Bob Kiss, to attend Saturday's events, which begin at 9 a.m. At 12:45 p.m., U.S. Senator Bernie Sanders (I-VT) - who visited Immokalee farm workers in Florida last week - will facilitate a pre-march panel entitled "Building a Movement for Universal Health Care and Livable Wages." What about Governor Douglas? According to his website, he'll be in town attending a "maturity expo" at the Sheraton Hotel. "It seems that [Douglas] is, more than ever, out of step on all the issues that affect Vermonters, like the war, like the climate, like health care," Haslam contends. "Hopefully, we can elect leadership in general that better reflects these huge [challenges] we're facing." For more information on the week of action, call 861-2877 or visit www.wsf2008vt.blogspot.com.